but also as a DVD/CD set. Go to http://evo88.com/en and do a search on "zappa". the KUDL-FM broadcast of the 'Cowtown Ballroom', Kansas, 1974/04/22 concert. the 1974 KPFK radio show. "Dark Light", due out on September 10, 2015. Actually, it's a box with three vinyl albums. - "Halloween In The Big Apple"
180 g clear, blue and yellow vinyl. To be released in October. 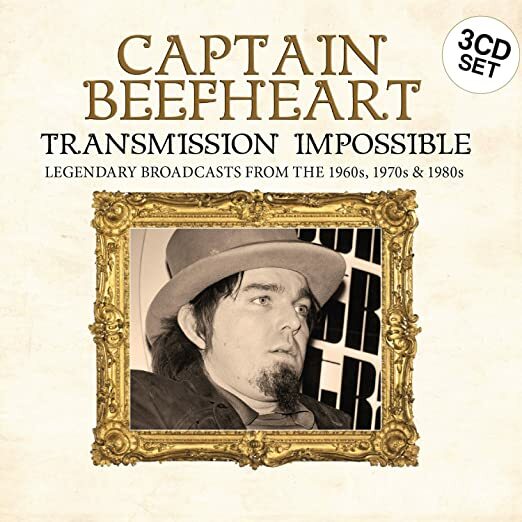 Chris Wade recently surprised us with "The Music Of Captain Beefheart", a 50-page book that walked us through the Captain Beefheart discography. Including various interviews. 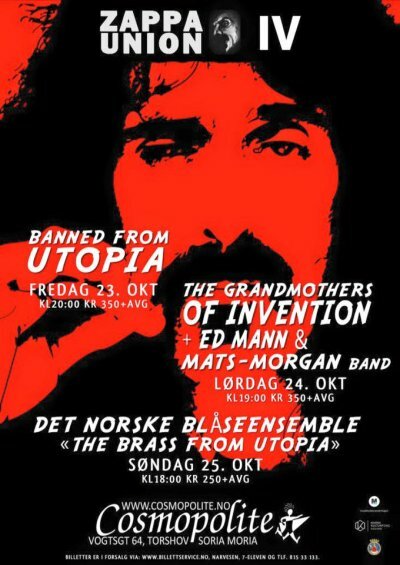 And now there's, "The Music Of Frank Zappa". 100 pages and subtitled "1966- 1976", so it looks like this is the first tome. Of at least three volumes, I would guess. Kazutoki Umezu's Kiki band performed at Zappanale #24, August 2013. They did an amazing concert. The albums that they had brought along, sold pretty well. I bought the complete package. A beautiful and great sounding set. 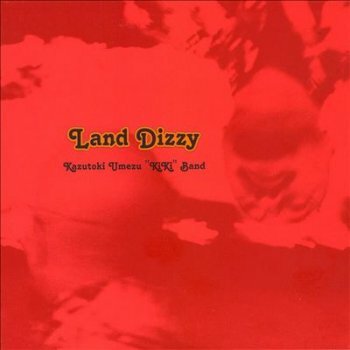 Too bad that one of the albums, "Land Dizzy", was already out of print. A couple of weeks ago, browsing the internet, I finally found a second-hand copy of "Land Dizzy". Eugene Chadbourne recently released a couple of new albums. These are typical DIY CDR-releases, each CDR coming in a package that has been fabricated by Eugene Chadbourne himself. "13 Society" presents a number of original tunes next to some excellen coverversions. Eugene Chadbourne on banjo, vocals, guitar, dobro, and Rogier Smal on drums. The album includes Lowell George's 'Willin'' as well as Captain Beefheart's 'Steal Softly Through...'. From the Greydisc album "Nowhere, Now Here"
The eight edition of the ROI France Event ! How does a 31-year old record label that specializes in avant garde, non-mainstream music and has released over 400 albums of high-quality music to date, survive and thrive in the 21st century digital age, an era in which all music  whether popular or avant-garde  has been devalued, and in which record stores have disappeared? How does it enable the impressive music in its back catalogue to not only live anew but also contribute to the future survival of both itself and the international composers/musicians who create that music? And how does it make the cutting-edge music it releases be financially sustainable as the century progresses, without compromising the stylistic integrity or “edginess” of that music? It re-imagines a radically new context, a parallel purpose, a fresh existence for the innovative music it also releases on albums. Cuneiform Records is proud to announce the creation of a new, sister company, called The Music Outpost, devoted to licensing cutting-edge music to various media including film/movies, dance, theatre, advertising, fashion, technology, and more. The new company launches on August 17, 2015, when the website themusicoutpost.com goes live. Numerous licensing companies already exist, but all focus on mainstream music; licensing avant-garde music is not a priority for them. In contrast, The Music Outpost  “licensing music on the Sonic Frontier”  focuses on ‘outside’ music and aims to ultimately be THE go-to place for creative media professionals to find music as adventurous as their projects. Its continually-expanding archive of music-available-for-licensing will not only feature music released by Cuneiform, but also music by other experimental, boundary-defying artists. A selection from The Music Outpost’s music archive is currently displayed on its website, www.themusicoutpost.com. The music can be explored through listening samples or various search methods (moods, music genres, film genres, instruments, etc). Search instructions are posted on the website, and users are encouraged to email themselves a list of their “Favorites”. While only a modest sampling from Cuneiform’s catalogue is currently on display, you can inquire about licensing other music on Cuneiform while new music that can be “readily licensed” is being added to the site. The Music Outpost will continually be updated, with new albums and new artists being posted regularly, so frequent visitation is encouraged. The website includes a means to contact the Outpost for queries about licensing for a specific project; licensing fees vary for size, type and nature of project. Projects of all size  from student films to blockbuster studio projects and everything in-between  are welcome to contact The Music Outpost. Cuneiform has long been internationally acclaimed for releasing genre-defying music, music that transforms and transcends traditional forms. Now, this innovative label has defied yet another boundary, to release music from its boundaries on turntables and iPods, and release it on dance and theatre stages, runways, and movie and other screens. Based in greater Washington DC (Silver Spring, MD), Cuneiform Records was founded by Steve Feigenbaum in 1984 as a record label devoted to releasing innovative music from some of the best musicians in the international avant-garde. It is the sister company of Wayside Music, a webstore and distributor originally founded in 1980 as a mail-order company devoted to internationally selling and distributing music released on small labels from around the world. The Music Outpost is the newest addition to this musically-progressive family. A new 3CD set will be released in September : "Impossible Broadcasts". 3 radio broadcasts on 3 CD's. The anniversary edition of "Thrak" offers a CD, plus an audio DVD ! 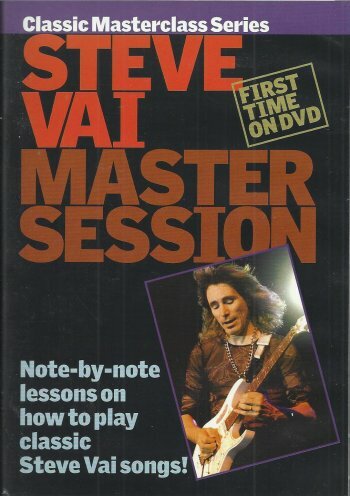 Adding pictures and data to the United Mutations Archives, here's a picture of Mike Wolf's "Steve Vai Master Session" DVD. It's an instructional / guitar tutorial DVD. Driving in to the town of Bad Doberan is like coming home. For quite a number of years now, the Zappanale festival has become the place where I meet friends and listen to good music. Two of my favorite things. 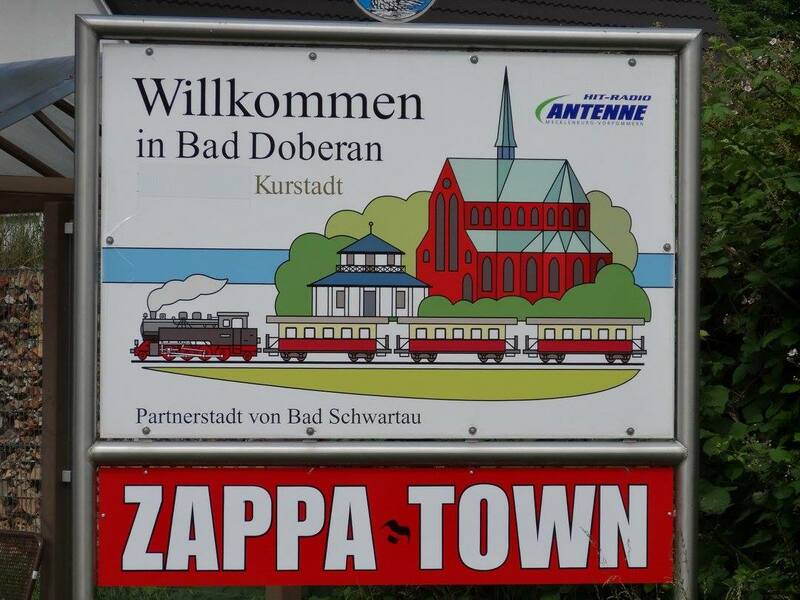 This year, I arrived in Zappa Town around noon. First things first, so I went to the expo in the centre of Bad Doberan. Before entering the actual expo (Cynthia Plaster Caster and her displays), I said hi to Robert, Dieter and Burkhard who, once again, had produced a fabulous expo. I also picked up a set of DVDR's with recordings of the concerts that had been given in the main exhibition the previous year. 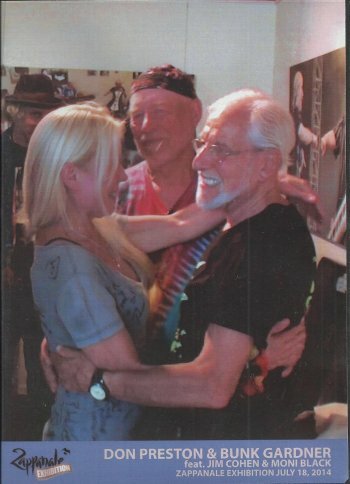 The first DVD that caught my eye was the Don Preston and Bunk Gardner concert and interview. I was in the audience at the time and had enjoyed it a lot. Great to see it being made available on DVD (and also on blu-ray). Having an asteroid with your name, or having streets with your name in Italy and Germany must be nice, but having your picture on a million dollar bill must be fun as well. I mentioned the fabulous Z3 in one of my previous posts. MoonJune Records has a mega sale from August 11-18 offered to all MoonJune fans, old and new, known and unknown, and curious. MoonJune Records – a progressive music label from New York City, active since 2001, which explores boundaries of jazz, rock, ethno, avant, the unknown, and anything in between and beyond – is offering a selection of 25 CD titles @ $5 each plus shipping (from the catalog of 75 titles). Dutch band The Ploctones are celebrating their 11th anniversary with a tour ! "Over the last two years we have been working on a fun new platform ...... check it out - it's a blast !" Check out Makhno's "The Third Season". Out on the Italian Brigadisco label. 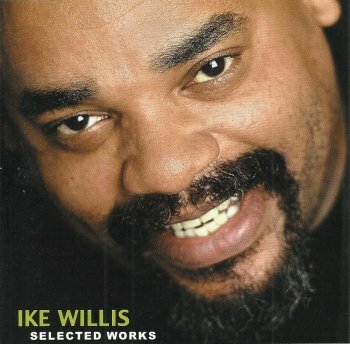 Former Zappa vocalist Ike Willis released two solo albums: "Shoulda Gone Before I Left" in 1988 and "Dirty Pictures" in 1998. With these two albums out of print, the Uwanna Records label released a compilation album "Selected Works" in 2002. Ike Willis was the vocalist (and one of the guitarists) in Frank Zappa band for quite a number of years and you can hear it in his compositions. Recently, at the Zappanale Festival, Ike did a concert with Zappatika. The concert started with three Ike Willis compostions: 'The Doctor Is In', '(Venting The) Krypton Gas' and 'Bizniz As Usual'. The first two can be found on "Selected Works", the latter one had me digging up "Shoulda Gone Before I Left". "Selected Works" is a great album. It might sound a bit dated, but I really like the compositions and Ike's vocals and guitar parts are great. The album also features Ray White, Arthur Barrow and Jeff Hollie. 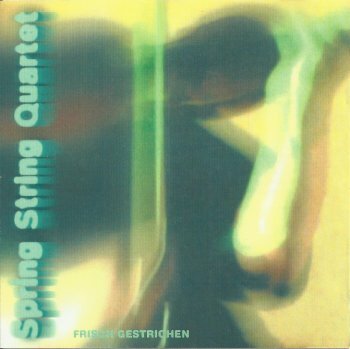 The "Frisch Gestrichen" mini album got released by the Spring String Quartet in 1998. It presents three excellent performances: Stevie Wonder's 'Sir Duke', Frank Zappa's 'Peaches En Regalia' and Jimi Hendrix' 'Gypsy Eyes'. I had never heard of it until a couple of weeks ago. Ex Frank Zappa sideman IKE WILLIS (USA) and founding member and front-man of Zappatika,ZAP McINNES (UK), have teamed up to write and orchestrate their first song together after successfully touring together in recent years with Frank Zappa tribute shows across Europe and the UK. Zap McInnes: “I once wrote an original concept surrounding My Little Pony. The pony is actually representative of the east European prostitutes who end up in the darkness of the red light district in Amsterdam, never to return to the forests of Lithuania and Rumania having been trapped into this lifestyle by manipulative pimps. Now, in our first ever collaboration, Ike Willis and I have orchestrated a completely new work incorporating elements of that original pony concept mixed with some newer ideas and some of Frank Zappa’s lyrics. The music is written and orchestrated by Mr Willis and myself. It is performed by ZAPPATiKA, featuring both Jeff Hollie and Craig Twister Steward. Ike features very strongly of course. The Pony Suite is pompous comedy, it is even operatic in parts but can best be described as prog-jazz-classical-rock. This new recording both evolves the Pony concept to fruition and also introduces some new characters such as the Beastial Boys and the Black Ninja. Willis will be on tour again with Zappatika in March 2016 in France & the UK. 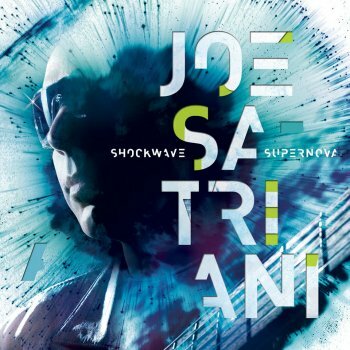 Next to Joe, the album features Mike Keneally, Bryan Beller, Marco Minnemann and Vinnie Colaiuta !! Concert tickets have been ordered. part two of the Zappanale 2015 Retrospect. "Nighthawks On The Radio", the CD-release of Tom Waits' 1976 KNEW-FM radio broadcast, will also be made available as a 2 LP set. Today, the Freakshow Festival in Burg Herzberg is presenting Ni, Poil and Hooffoot. "Ni and Poil will also take part in the Freakshow Artrock Festival in Würzburg on the 25th and 26th of September, alongside many other french, japanese and belgian bands to celebrate 45 years of Zeuhl music." Eugene Chadbourne has released a couple of new album. 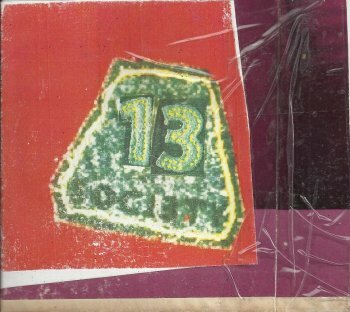 The latest one, "The 13 Society" includes Eugene Chadbourne and Rogier Small performing Lowell George's 'Willin'', as well as Don Van Vliet's 'Steal Softly Through Sunshine'. EVERY WEDNESDAY in AUGUST (5th, 12th, 19th, 26th). 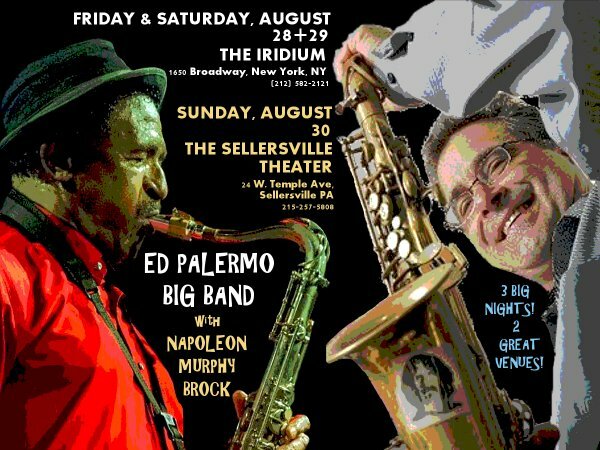 This series of events will explore new and classic material from their extensive repertoire of psychedelic performance art, mixing jazz and eastern influenced experimental rock. The Jazz Punks will be immersing themselves in the seedy depths of Spanner surrealism and DIY punk composition; expect themes and stories developing conceptually and continually throughout the residency. I'm pretty sure that they'll throw in some Zappa music as well. Singer-songwriter Tim Buckley recorded two album for Frank Zappa's / Herb Cohen's Straight label: "Blue Afternoon" in 1969 and "Starsailer" in 1970. Later albums featured former Mothers Of Invention Buzz and Bunk Gardner (and John Balkin). "Newport '68" is a brand-new Tim Buckley release. It's taken from a radio broadcast. On the 28th of July 1968 Tim Buckley took to the stage at the Newport Folk Festival after being introduced as an artist who “in the great Ogden Nash tradition of poetry, has been writing and singing his own songs, in a fairly modern idiom, which sits, however, very, very comfortably on a fine bed of old folk music.” It was a description that would have sent a shudder through Buckley. Tim Buckley had always been a restless, questing musical spirit and he moved on from his work almost as soon as it had been recorded; by the time of ‘Happy Sad’ in 1969, he had started to feel his way towards the jazz direction that characterised the revolutionary, avant-garde rock of his ‘Starsailor’ period. However in the run-up to ‘Happy Sad’ Buckley had started to feel constrained by the expectations of both his audience and his record company, Elektra. Album sessions in ’68 had yielded a series of recordings that he ultimately abandoned and never released, many of which survived only from live performances until posthumous collections made them widely available. The appearance at Newport in ’68 reflects some of Tim’s struggle over artistic direction; together with material from both ‘Goodbye and Hello’ and ‘Happy Sad’, he performs two songs, ‘Wayfaring Stranger’ and ‘The Dolphins’, that were recorded and discarded during the ‘Happy Sad’ sessions. Indeed, it’s clear from another ‘68 performance of ‘The Dolphins’ on the BBC’s ‘Old Grey Whistle Test’ that that song in particular was very much on his mind. And so this concert, broadcast live from Newport by radio stations across America, is a fascinating glimpse into the artistic muse of one of music’s most fertile and singular minds, at a key crossroads in his tragically short career. Los Angeles - One of the most eagerly awaited releases of 2015 by the Anderson/Ponty Band, featuring music icons Jon Anderson and Jean Luc Ponty, is scheduled to hit the streets early Fall 2015! “Better Late Than Never” is the new album taken from a live performance, and enhanced with innovative production. The package includes a bonus DVD featuring outstanding performances by the band captured in September 2014 at the Wheeler Opera House in Aspen, Colorado. The Anderson/Ponty Band has created some breathtaking new musical compositions. “Better Late Than Never” also showcases rearrangements of classic YES hits like “Owner Of A Lonely Heart”, “Roundabout” and “Wonderous Stories”, as well as some of Jean Luc Ponty's beloved compositions, with Jon's lyrical vocals and melodies enhancing the music and creating a very special and unique sound such as “Infinite Mirage” a new song incorporating Jean Luc's classic tune “Mirage”. The Anderson/Ponty Band also includes Jamie Glaser on guitars - well known guitarist who has worked with Jean Luc Ponty, Chick Corea, Bryan Adams and Lenny White; Wally Minko on keyboards - virtuoso player and composer who has performed and recorded with many worldwide stars including Pink, Toni Braxton, Jean Luc Ponty, Tom Jones, Gregg Rolie and Barry Manilow; Baron Browne on bass who has played with Steve Smith, Billy Cobham and Jean Luc Ponty; and Rayford Griffin on drums and percussion, who has played with Stanley Clarke Band, George Duke, Jean Luc Ponty and Michael Jackson. The band visit the music created by Jon Anderson and Jean Luc Ponty over the years with new arrangements, virtuosic performances and new energy.